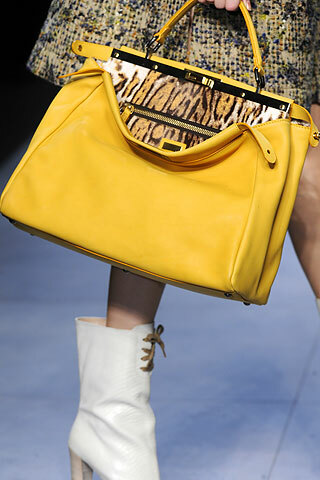 The Peekaboo line designed by Fendi and launched in spring/summer 2009 collection. The bag is lovingly named after this favorite child hood game as the top flaps are extremely easy to open and shut very quickly, keeping your items safe while allowing for an ease of access. Able to be closed by twist locks, all items are kept safe during transport and easily accessible. Some say the "Peekaboo" name comes from the way the bag is shaped. The bag opens at the top, the clasp and strap attached on one side. The other side, with the soft supple leather drops away with a slouchy look to reveal what is inside. 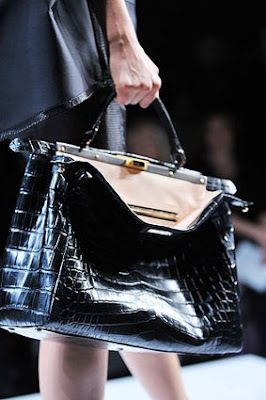 Others say the name refers to the signature Zucca jacquard lining material that peeks out when the bag is opened. In either case, the bag has both adorning features. The finest materials go into every Fendi product. Leathers, canvas, suede, corduroy are all the finest available. The Fendi peekaboo series comes in a variety of styles, sizes, and materials like goatskin leather that give it its characteristic look. Available in a wide range of colors it is perfect for matching up with a range of outfits. Sophisticated black patent leathers to the classic browns or light colors like ivory or purple is sure to brighten up your look. The leopard skin pattern may get you stopped on the street to inquire about what bag you are carrying. Each option is a bag that any woman would be excited to carry. A number of options are available for the Fendi Peekaboo bag. Use the smaller size models as a clutch purse for a night out, the medium size bag for everyday use and the larger satchels when you require extra room since they will carry more. Speaking of carrying this bag, use one of the two handle options. Use the one handle to carry in your hand or by your side or the longer shoulder strap. A large spacious compartment will hold your bigger items. There are interior wall and zippered pockets for smaller items. Protective metal feet provide a stable base while keeping the bottom clean and avoiding scratching or scrapes. From humble beginnings in 1925, Fendi's entrepreneurship and creativity, meshed with superior craftsmanship have given birth to about 160 Fendi shops and multi-brand stores worldwide. In addition to online shopping offered by a number of well-known department stores, Fendi maintains ten flagship stores worldwide and Fendi products are available at numerous multi-line retail stores. Fendi's craftsmen apply their skills to each and every detail at all levels of their production process. It is impossible to imagine what these world-famous handbags would be like without this level of attention to detail. Everything about the Peekaboo says fashionable, sophisticated For spring 2010, Fendi launched the timeless “Peekaboo”- Selleria, a simple, unstructured gem that not surprisingly enjoys a very long waiting list. Working with Fendi craftsmen, the customer chooses from Selleria leathers such as Cuoio Romano; exotic skins (crocodile and ostrich) and even precious furs (mink, fox and orylag). There are also 37 colors and an assortment of refined details such as suede, nappa lining, lino lario and gold accessories. You can also engrave your name on the silver panel inside the bag. When finished, the custom creation comes delivered in exclusive packaging: a Selleria box, complete with a Selleria pamphlet and conditioning cream, along with personalized (and signed) letter from Silvia Venurini Fendi. Each Selleria product is the unique one in the world.You not only could choose color and material as you please but also your name in pure silver link. It is personalization. 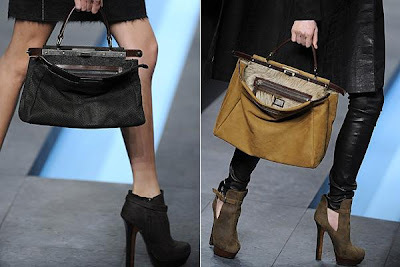 Fendi bags are well known and popular. Many A-list personalities and celebrities have been seen with these elegant and functional purses. The Fendi Peekaboo handbag is a fun and distinctive purse that any woman would want to have in her collection. Stylish and functional, it will stand out in a crowd. A true designer piece from a well-respected company that will last for years. love the bags great post!! It was very interesting to read. Peekaboo is definitely my dream bag. who doesn't love this bag!? that outfit that Serena is wearing was my fave of the season!! Me gusta Fendi, pero no me gusta el precio de las cosas de Fendi. Lovely blog you have here!! 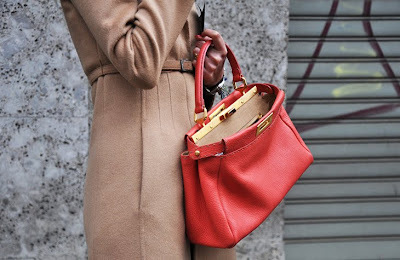 Great to have a blogger about handbags and their history! I am now following you hope you do the same back. Thanks. Blake is always the best!!! the peekaboo is one of my favb bag! Hope you can have a look at my latest post! aweee... I love your blog concept! Amazing choice of bags! Fendi Peekaboo is spectacular!!!! would you like to follow each other??? Intersting blog, wanna follow each other? First time visiting your blog, hope you'll stop by and would you like to follow each other? This handbag is so beautiful, I can't even begin to explain it. I love it. Thx for your comment, would you like follow each other?? I love this style of bag! Oh wow lovely bags the last picture of Blair is just perfect! That last picture is gorgeous! I love that it is (or might be) called the Peekaboo bag because of its shape! thanks for stopping by and commenting! this bag is incredible! love the yellow bag! so pretty!